We can reproduce the original paint for your vehicle using the paint colour code as originally supplied by the manufacturer. 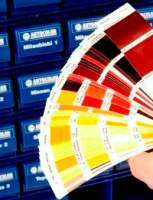 Our paint is custom mixed using professional paint mixing systems from ICI (Nexa Autocolour), Lesonal and Mipa. You will need to supply us with the colour code. Click here to view our guide to find your car paint colour code. We supply paint in an easy to use aerosol spray can for small local repairs and touchups, or in 250ml to 5 Litre tins, for larger car body repairs. Use the drop down menu below for a full list of prices. For metallic paint, we recommend that you also purchase some lacquer for a shiny professional finish. IF YOU KNOW YOUR PAINT IS METALLIC (BASECOAT) PLEASE USE THE DROP DOWN MENU ABOVE TO CHOOSE METALLIC (BASECOAT) PAINT RATHER THAN SOLID CELLULOSE, AS THERE ARE TWO DIFFERENT PRICES. THIS WILL SAVE ANY DELAY IN YOU RECEIVING THE PAINT AS IF THE WRONG TYPE OF PAINT IS CHOSEN WE WILL HAVE TO CONTACT YOU FOR ANY PAYMENT ADJUSTMENTS. PLEASE NOTE THAT FOR METALLIC (BASECOAT) COLOURS IF THE COLOUR HAS A HIGH AMOUNT OF PEARL OR MICA IN THE MIX WE RESERVE THE RIGHT TO CHARGE MORE FOR THE PAINT AND YOU WILL BE CONTACTED WITH DETAILS OF THE ADDITIONAL CHARGE BEFORE THE PAINT IS MADE UP. These are in Rare Circumstances. If you need any technical help with this item, please call one of our trained advisors on 01273 326981.